the lilly: what happened to CHLOE? damn it's night duty again! this is my second night at ward. thanks God tomorrow saya cuti sampai sabtu! yeay!!! i supposed to update my blog last night but since i receive a call from someone who stresses me. i didn't even have a mood to open my laptop! i cried and then i slept. yeah, it's my best way to relieve stress. it's a family matters. i can't really elaborate what happened here but i got new lesson from it.
" it's really hard to say NO to someone you call family "
gosh!, why am i bluffing about my stressful night? as in my earlier post chloe's missing! I've been searching all over the building and even put a poster on every wall of my apartment. well, some resident are concern and text me while i am struggling at gunung kinabalu saying they've seen a cat like Chloe. i called my housemate to get chloe but she's said she can't find chloe. so, after 2 weeks i still can't fine chloe so i gave up. i even sent alejandro to kampung because having Alejandro without chloe around just gonna make me feel more sad. but then on the third weeks of Chloe's MIA. i suddenly saw her on the street running and meowing at me. i almost can't recognize her since she became skinnier (sudahlah memang skinny sedia.. :-( ) and dirty! she look scared when i approached her. i took her home, bathed her and feed her. and then i realize some of her back skin has been peeled of and wounded. maybe someone has pour a hot water to her back before. 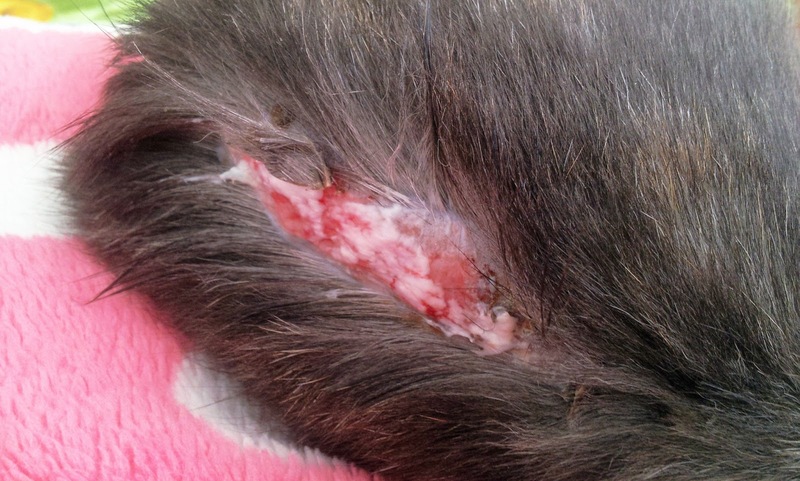 this is after i clean the wound and put some antibiotic cream on it. of course her behavior change. chloe's become insecure and passive for like 1 weeks after i found her. but then it only last for a week and then now she's back to her old behavior. now alejandro also back with me since he created so many problem at kampung. my father said he became a gangster kampung fighting with other cat. 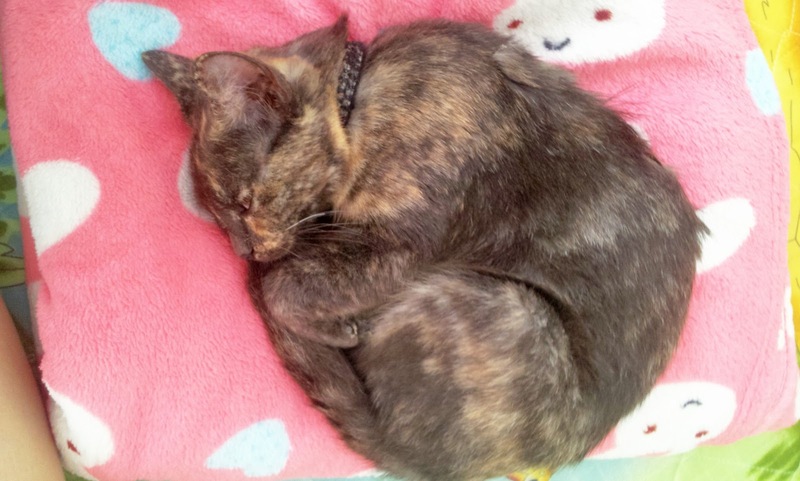 i am happy that chloe's return home safe. still i it's a good experience for chloe. at least next time kalau dia hilang lagi i know she'll survive out there..
mau bawa chloe sama jandro jalan-jalan kawasan rumah la lain kali supaya chloe's tidak sesat lagi. a week after i found chloe, i receive a phone call from another resident saying that she have a cute kitten to give me if i still haven't found my cat. i think if i still haven't found Chloe i might keep the kitten. thank you to the kind unknown caller for her concern, but i've found my skinny chloe's now!! l i l i e s. j o h n.
aikkk dia p bergaduh lagi??? aww thank God Chloe is SAFE!!! sama la kita shery. tp sy bukan nangis la. sy marah2 tanpa sebab dlu baru tidur kalo tpau stress hehehhe..